Discussion in 'Masonic Education' started by mch4970, Oct 19, 2010. John M. Burchfield is intimately acquainted with one of the worldâ€™s oldest and most mysterious fraternitiesâ€”the Freemasons. As a past master in the Blue Lodge, Burchfield has not only witnessed the societyâ€™s secret rituals but has participated in them. He has intimate knowledge of the meanings of the ceremonies and the principles taught by the Freemasons. 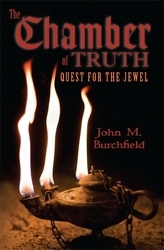 In his new book, The Chamber of Truth: Quest for the Jewel, he has chosen to transform these remarkable experiences into a riveting tale full of danger and intrigue. The novel, inspired by Freemasonry, centers on a brotherhood of men faced with temptation, all the while striving to remain true to their principles. In The Chamber of Truth the main character struggles to uncover the truth about his ancestry as he is confronted on all sides by conspiracies, deception, and betrayal. Burchfield masterfully constructs a world steeped in ancient religion, the society of Freemasons, and the inner workings of the city of Jerusalem. Spoken through the voice of a member of the society, The Chamber of Truth offers an unprecedented glimpse of the true power of the principles and belief system of the Freemasons. John M. Burchfield is a Freemason and member of the Grand Lodge of Ancient, Free, and Accepted Masons of North Carolina. He resides in Asheville, NC with his wife, Debby, and recently retired from a thirty-year career in law enforcement. He now spends a good portion of his time writing and running the mountainous trails in the western region of his beloved state. Heâ€™s completed over twenty marathons including Boston. He hopes to continue to write and run as long as his mind, body, and the good Lord allow it. The Chamber of Truth was published by The P3 Press, a division of Brown Books Publishing Group, an independent publisher based in Dallas, Texas.